Short on space? Then straw bale gardening might just be the answer you are looking for. Two summers ago I was driving down the road on my way to the store. I remember passing a home with about 8 bales of straw sitting in their front yard all lined up in rows. I really didn’t think much of it other than my crazy neighbors were getting ready to host a picnic of some sort. About a week or so later, that same house had those same bales all sitting in the same position as they were the week before. Funny thing was those bales sat that way for not just days but weeks and as I watched them, something pretty crazy happened. I realized they had plants IN those bales of straw. As soon as I got home I did a little research on my computer and found out that gardening this way is actually a THING. And that was my first introduction to straw bale gardening. Fast forward to the following summer, to be specific, the very end of that gardening season when my garden went from thriving to dying overnight. Unfortunately, this is a risk all gardeners take. Disease, pests, Mother Natures twisted sense of humor, are all things that can destroy months of hard work in the blink of an eye. Why on earth we continue to plant gardens year after year is beyond me. But that is just what we do each spring without fail. That particular year after some extensive research I found I had a pretty big problem with my soil. Disease had taken a hold of my ground and nothing was going to fix it other than leaving it to sit dormant for 2-3 years. Let me just tell you that this was a blow I wasn’t prepared for. Not gardening at all for 3 years wasn’t an option, so I needed to find another location for my vegetables to grow while I allowed my main plot to heal. I did my research and remembered a city friend telling me how she has her entire garden on her patio. I thought I would try a couple of different containers to see how things faired. 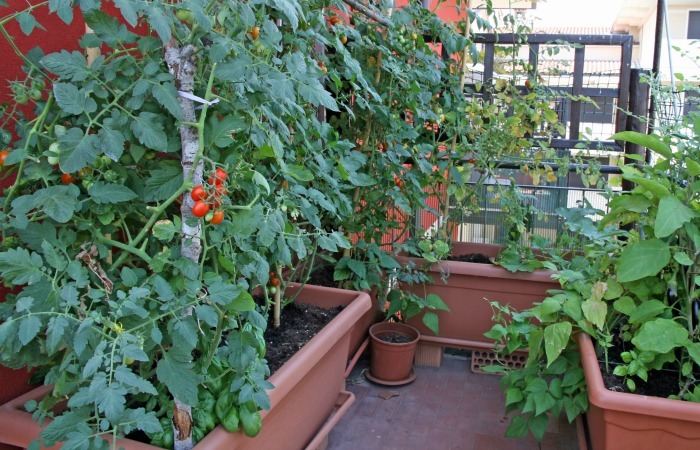 If this option intrigues you, you can read exactly how to grow both tomatoes and pepper plants in just about any type of container by clicking the links below. As I was looking for unique ways to grow my veggies up on my patio, I remembered those straw bales I saw a few years ago. I began to research and you know what? Straw bale gardening is actually a common practice. Little did I know that straw bale gardening has been around for years….literally thousands of years. Straw bale gardening is a way of using a bale made of straw as your actual garden. To grow your plants INSIDE of the bale using it as the container for the roots to take hold and thrive. This type of unique gardening is not only a solution to a lack of space issue, but it is also a great “plan B” for those folks that live in less than optimal conditions. It remedies the issue of poor soil, helps reduce the harder gardening tasks of tilling up the ground, and finally helps those that are faced with limited space. Oh, and let’s not forget you can put that straw bale (almost) anywhere…..as long as you have sunshine – you can set up a straw bale garden. If you are like me I am sure you are pretty intrigued to know just how straw bale gardening works. It’s really quite brilliant when you think about it. What you are doing is using the straw bale as the actual “container” for your plants. The trick is to compost down the INSIDE of the bale creating the perfect environment for the root systems of your vegetables. The strings, also known as twine, that hold your straw bale together will also hold the container together making it the pot for your plants. A bale of straw will equal approximately 40 gallons of space. So if a tomato plant requires 5-10 gallons of space you can safely expect to grow 4-8 tomato plants in 1 straw bale. Ninja tip: Please know a rain-soaked bale of straw is a HEAVY and moving one at that point is not recommended. The twine holding the bale together is not meant for a water-soaked bale so always move when dry to prevent breaking your twine and losing your bale all together. The center of the bale acts as the ground where the roots will grow. Yep, just about everything you need is all right there in your straw bale. The drainage of the bale is another plus since this helps to prevent conditions such as root rot and other soil born diseases. All we need to do is a little prep work on our part to get that bale ready to house and grow our plants all season long. And the best part of straw bale gardening? When finished, you can add the entire bale to your compost bin at the end of the growing season. (Minus the twine) It is important to make sure you only use straw bales and not hay when gardening this way. What is the difference between straw and hay? When it comes to gardening, straw vs hay is an important factor that must be determined before diving in. Most folks use the term interchangeably not truly knowing the difference and that can be a pretty big problem. A straw bale is made of up stalks which is the wasted product of wheat. This type of bale is most commonly used as bedding for livestock. It contains no seed heads or seeds so it can be safely used in gardens as a mulch or a winter cover. A hay bale is cut grass or alfalfa and is used to feed livestock. It contains every part of the plant including the seeds. If you use this type of bale in your garden beds you will be adding a load of seeds to your beds including weed seeds as well. Trust me on this, I have done the legwork. Hay in a garden is a no-no and will only cause you to have to weed more than you ever imagined. If weeding is something you detest as much as I do you can follow a few of my best tips to keep those weeds to a minimum. 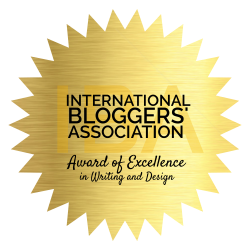 Click the link below and save it (or pin it) for reading a little later. Final word to remember: always want to make sure you are using straw bales when growing anything and hay bales when feeding anything. Since we are using straw to grow our plants, when we have finished the growing season the entire bale can be then added (be sure to remove the baling twine first) to your compost bin or your garden without the risk of adding any additional seeds. Be sure to only purchase straw bales from reliable sources. You can read more on the importance of this below. Which plants grow best in a straw bale? Straw bale gardening can be used to grow just about anything. Tomatoes, peppers, squash, and cucumbers are my top list to try out this year but that is not all you can grow. Your rule of thumb here is this, if you can grow it in a single season in your garden then you can grow it in a straw bale. Yes, that even includes herbs! When setting up your DIY straw bale garden you will want to make sure you have plenty of sunshine, at least 8 hours a day. A note of warning here. A straw bale garden acts just like a sponge and for that reason, it will require more watering than a normal garden. Keep this in mind when choosing a location so it is somewhat close to your water source. Let me just jump in here and say that straw bale gardening may not be the best option for city gardeners. If you have ever tried to move a water-soaked bale let me just tell you it is easier to move a sleeping cow. A wet bale is HEAVY and with only the twine holding it together, it is very hard to move. Also, a straw bale may not be the best option for wood porches or decks. Again, those bales get and stay pretty wet on the bottom risking staining or even rotting of the wooden floors they are on. I would suggest an opened area such as a garden, vacant flower bed, or another patch of yard that is in full sun throughout most of the day. Okay, now that we have the logistics out of the way, let’s get down to business. Ninja tip: Before we go any further you will need to prep your bales for a full 2 weeks before you can plant them so please keep this in mind when setting up your timeline. Step #1 Purchase your straw bales. I would suggest you find your bales at a local farm. You can just call and ask if they have any straw bales to sell and most, if not all of them, will. They can cost anywhere from $2.50 – $5.00 a bale depending on where you live. I prefer to purchase mine from a local farmer so I am sure to get a good quality organic straw bale that I know the history of. Step #2 Find the best layout for your straw bale garden. Like I mentioned above, you want a spot that is close to water and has plenty of sunshine. 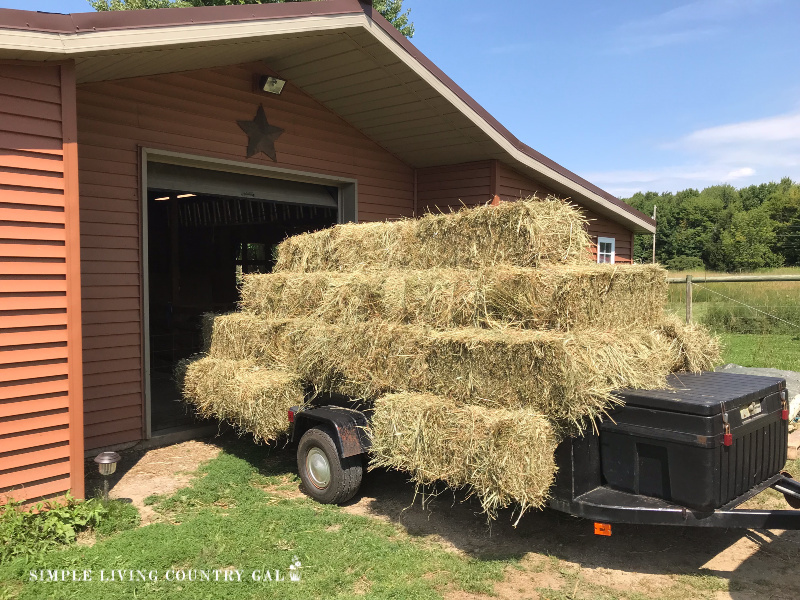 Depending on the area you have to work with you can either set your bales up into rows or another formation that works well in the space that you have. I have chosen to keep mine in our flower bed next to our back deck. This way I can water easily when I am watering my planters and they will have a bit of shelter from the crazy high winds that we are accustomed to here. Ninja tip: Place your bales on a tarp or feed bag to deter weeds from growing up into the bale. This also helps a bit if you do have to move once planted. You can use the tarp to “drag” your bale from one location to the next. Remember once a bale is wet do not use the twine to move or you may run the risk of snapping the strings and causing your bale to fall apart. Position your bales however you want them. In rows, in a “U” pattern, or randomly tucked into the spaces you have available. Be sure you lay your straw bales with the cut side up or sideways. You know your bale is sideways because you will have your twine around the OUTSIDE of the bale holding it all together. The reason we want it sideways is for easier composting and planting. 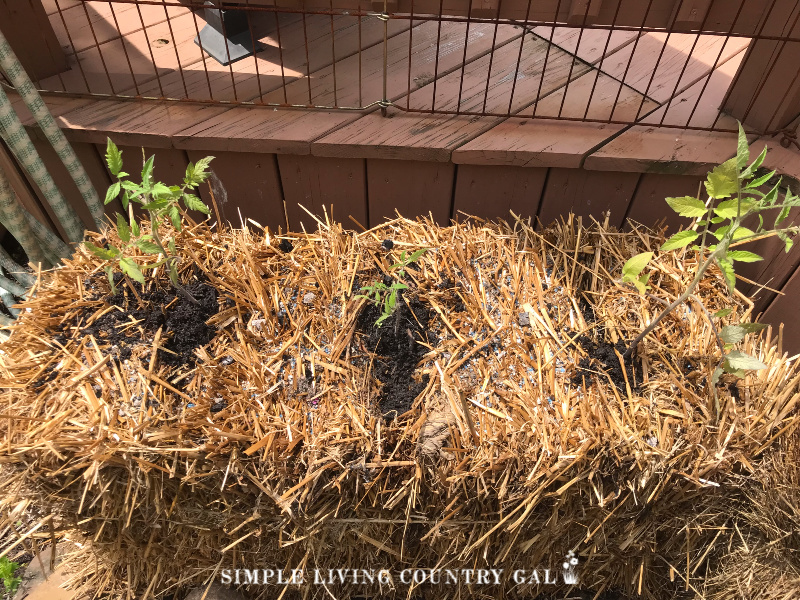 Step #3 How to condition a straw bale for gardening. Warning-a little boring science coming up! I learn best when I know WHY I am doing things so that is how I am going to explain this part to you. Like I mentioned above, we need to prepare each bale by jump-starting that center and encouraging it to compost down for the roots of our plants. Our goal is to turn the inside straw into the ground where our roots will grow. Right now it is just straw and we need to transform it into soil using the interior heat, water, and a few additives to move things along quickly. To do this you will need Nitrogen and lots of it. The best way to do this is with some good old lawn fertilizer with an NPK of 29-0-4. NPK stands for Nitrogen/Phosphorus/Potassium and each one plays a roll in fertilizing. Nitrogen works well for developing leaves and stems. Potassium promotes healthy roots and prevents diseases. To prep your bale you will need to do things in a certain order. Approximately 2 weeks before you begin planting in your bale you will need to condition the inside to get things composting and cooking. We are going to do this by wetting and adding fertilizer and wetting some more. This combined with the warmth of the sun will jumpstart the inside of the bale in a magical, yet scientific way. Ninja tip: If you have children you will want them to get involved here. This is a great learning experience and really shows us how the science behind composting works! Step 1. Gather up all your supplies. Organic Fertilizer with an NPK of 29-0-4. I highly recommend you purchase this locally so you can thoroughly read the label on the bag. You want to NPK to be as close to 29-0-4 as possible. You need large amounts of Nitrogen to jumpstart the composting process and that is why 29 is recommended. Also, be sure to verify that it does not contain any weed protectant or pesticides as this will harm your plants. Wood ash – mix with the Bone/Fish Meal to jump up the level of Potassium. Compost thermometer – not necessary but a great way to check the internal temperatures of the bales. Step 2. 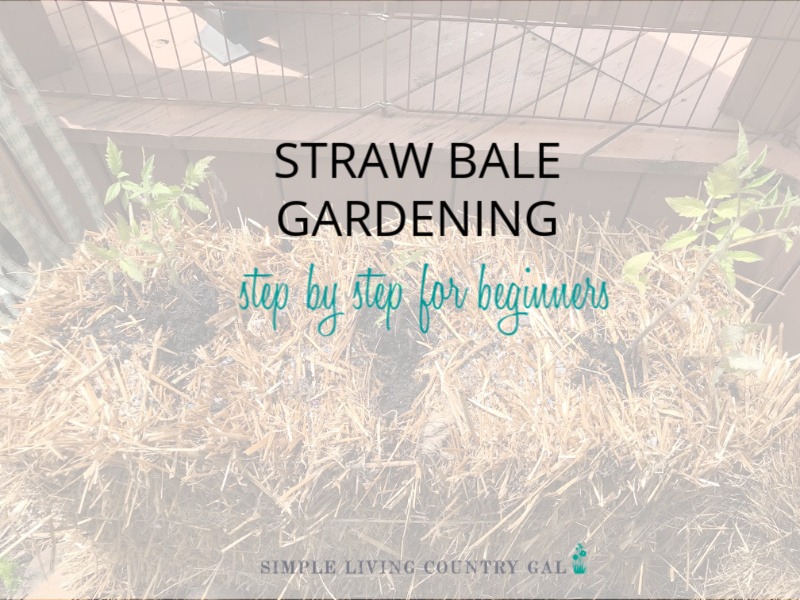 Follow this process to condition each of your straw bales for your garden. Ninja tip: Check the temperature as you go along. As things are composting, internal temps can reach 125 degrees. This is too hot to plant in. After about 2 weeks the internal temp should be about 75-80 degrees, Fahrenheit meaning you are ready to plant. If you do not have a thermometer just use your finger to test. It should be warm but not hot. There are many ways to condition your straw bales in preparation for gardening, this is the one that I used and it worked very well. Day 1 – Sprinkle 2 cups of fertilizer over your bale and water thoroughly to push that fertilizer down into the bale. 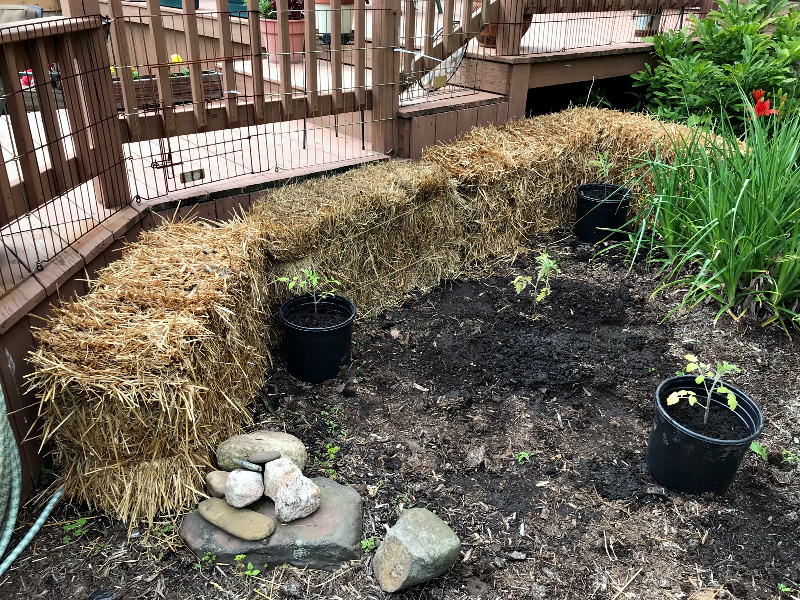 Day 2 – Water your straw bale. 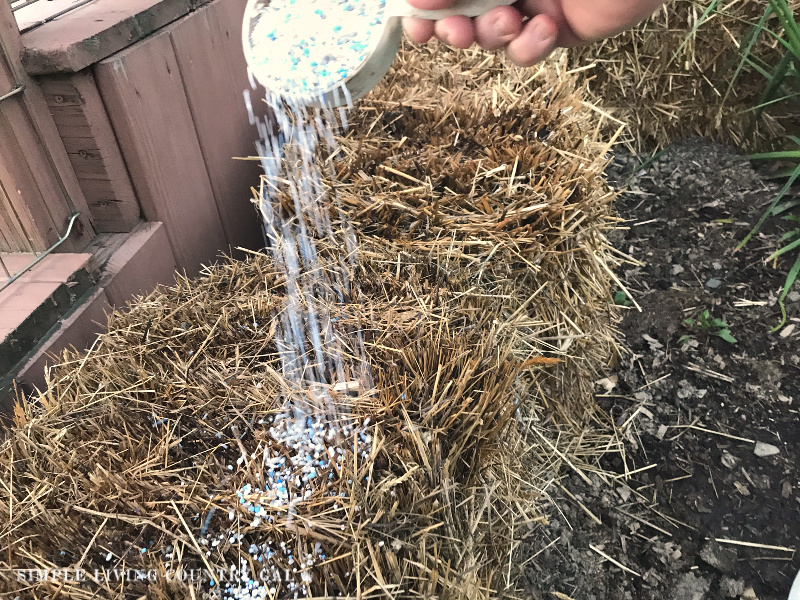 Day 3 – Sprinkle 2 cups of fertilizer over your bale and water thoroughly to push that fertilizer down into the bale. 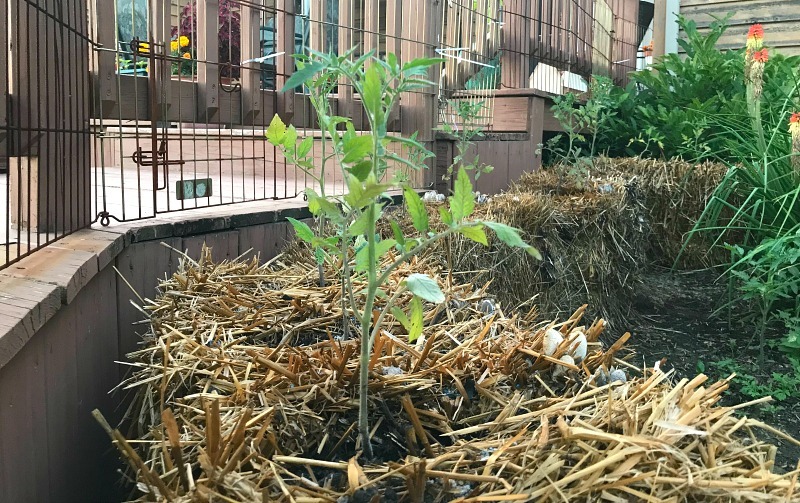 Day 4 – Water your straw bale. Day 5 -Sprinkle 2 cups of fertilizer over your bale and water thoroughly to push that fertilizer down into the bale. Day 6 – Water your straw bale. Days 7-13 – 1/2 cup of fertilizer each day followed by a thorough watering to push the fertilizer down into the bale. Day 14 – Add 3 cups of Bone/Fish meal + wood ash. After day 14, your straw bales are ready to plant. Step # 5. Planting vegetables in your straw bale gardens. Once you have conditioned all of your bales, you are ready to plant. As I said before, just about anything can be grown in a straw bale. Let’s go over a few of the most common ones. Planting tomatoes, peppers, squash, and other plants. This is the best part because of how simple it is to do. Open up a space or opening in your bale and simply place your plant along with the dirt from its pot inside. I like to add a stake near any tomato plants to use for support as it grows. For an averagely sized bale, you should be able to fit 2-4 plants comfortably. Add a layer of peat-based soil to the top of the bale to keep your seeds in position. Once added just use your hand to “pat” it down and then water lightly so the soil is held in place. Once done you can plant your seeds as desired following directions for spacing and depth. The trick with potatoes is knowing how they grow. They do so along the stem of the plant BEFORE it reaches above the surface of the ground. For that reason, in normal soil, it is suggested you mound up the dirt to allow an easier time for potatoes to make their way towards the surface. 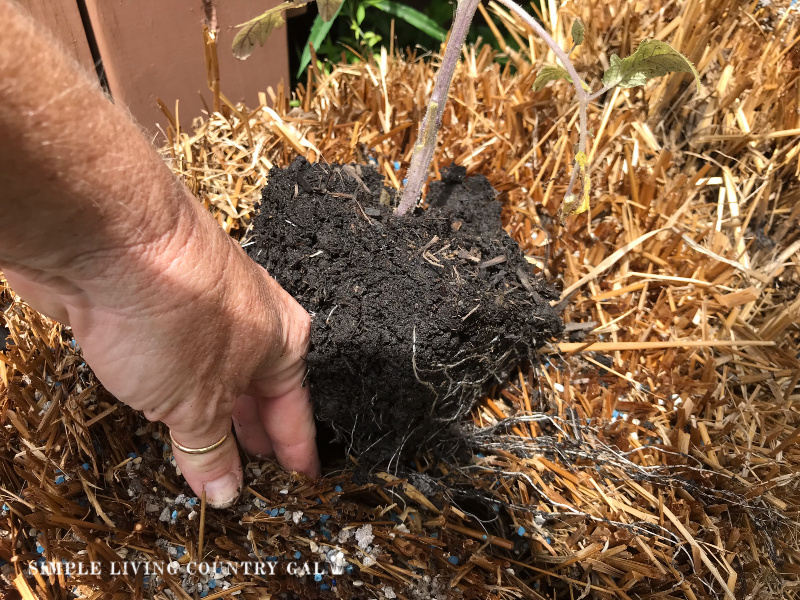 In a straw bale garden, you can plant your potatoes deeper because the matter in the bale is loose and easy for the plant to travel and reach the surface. To plant your potatoes you will want to open a space in the bale itself and place your potato cutting about 16-18 inches deep. A straw bale can easily hold 3 plantings each. You will know when your potatoes are ready for harvest when you see flowers on the vine. This is your cue as to the earliest time you can open up and gather your potatoes. Ninja Tip: Use the surface of a potato straw bale to plant early harvested seeds such as radishes. This will get more use of your bale. Potatoes take approximately 10 weeks whereas radishes just 3 weeks. This will allow you to harvest all of your radishes while waiting for your potatoes to finish growing. Open up the bale and place your onion set inside. Move things around just a bit to make room for that set to grow into a bulb. Keep depth and spacing the same as when planting sets in the soil which varies depending on the variety you are planting. A good rule of thumb is 2-4 inches apart and a depth of a few inches. As the onions grow they may raise up out of the bale a bit. If this happens, gently push them down into the straw bale again. Harvest when the green stalks begin to yellow leaving the dirt on the bulb to dry for a few days before removing. This might just be the most fun part of straw bale gardening. Growing herbs is easy and a great way to really utilize the space you have to work with. Since herb plants stay relatively small and lightweight you can plant them on the SIDES of the bale. Open up a small opening in the sides of the bale at either the halfway point or higher. Place your herb plant inside along with any soil from the transplant pot. When you water the bale you will be watering all the plants including the side plantings of your herbs. Possible straw bale gardening problems. As with anything, there are always risks to consider and that is true here as well. I mentioned above the importance of researching the straw you purchase as to the history behind its growth and there is a reason for that. If you plan to put your used up bales into your compost bin or directly in your garden, it is extremely important to know what was used to not only grow bale but the soil it was in as well. If pesticides were used in the soil you are in turn running the risk of adding residue from those chemicals to the soil in your own garden. Bottom line is to know where your materials come from and what their practices are. Don’t be afraid to ask plenty of questions and only purchase from reputable sources. Have you tried your hand at straw bale gardening? If so, please leave a comment below I would love to hear from you!